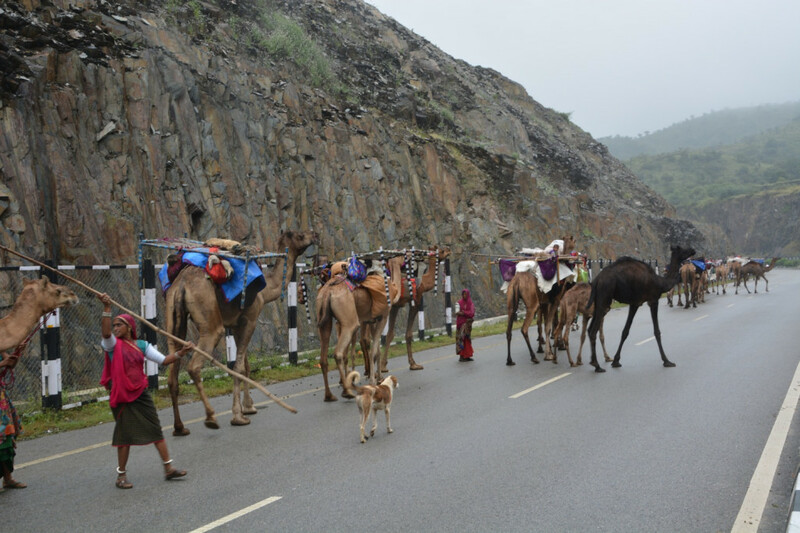 The drive through the countryside from Udaipur to Pushkar was a feast for the eyes. Rolling lush green hills with rocky outcrops, spotted with vibrant colors from the many women out and about. No matter how rural or remote you try to get in India, you are never alone. Not 15 minutes out of town we encountered bands of gypsies, or nomadic folk, walking as confidently on the newly minted freeway as off in the dusty hills. Their camels were well adorned, and many a baby were strapped to the platforms atop their humped backs. Our next encounter was with some shepherds, red turbans the only color on their bodies, otherwise draped in white cloth, driving their herds of hundreds of goats cleanly towards us on the road. As we turned off onto the smaller country roads, we were entertained for hours by the quaint scenes of village life: ordinary markets brimming with life, schoolchildren clad in uniforms riding rusty old bicycles towards home, hair in long black braids, and a buzz of activity where we could imagine little industry other than agriculture and quarries for marble. We did happen upon a festival in one small village where the men and boys were all milling about the dirt road through town, made up with charcoal under their eyes, lipstick melting from their lips, and wearing sparkling barrettes and ribbons in their hair that any young girl would covet. It reminded me faintly of a fabulous cross-dressing party from the 1980s. The boys were very excited to see us traveling through, and stopped the car with their palms on the windows, eager to interact and pose for pictures. Through our driver we learned that school was out for the day and that this was a special festival local only to this village, but we were unable to learn anything more about the tradition. 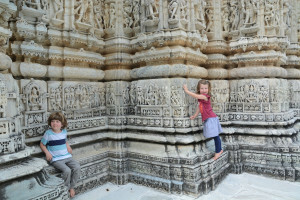 Oddly, Phineas and Eilir did not seem to notice the costumes, at this point merely taking it in as ordinary India. We arrived to Pushkar after sunset, crossing over Snake Mountain pass to descend upon this important Hindu pilgrimage site (all devout Hindus are supposed to try and make it there once per lifetime). As such, the entire town is vegetarian: there is no meat or alcohol allowed inside the town limits. The main focal point of the town is the lake, said to have formed when Brahma dropped a lotus flower, where people come to bathe in the sacred waters at any one of the 52 ghats and pray at one of the 400 temples. No pictures are allowed, so you wont find many here. Taking a break from our luxury accommodation, we decided to try out a guesthouse that shared a garden with a krishna temple. It had been described online as “austere”. This apparently translates better as “a cinderblock cell with no windows or fan with a grumpy owner” so we had to scramble to come up with something bearable. We found the Inn 7th Heaven after checking few places and there we spent the night, kids lying prostrate on their bed, beads of sweat dampening the sheets. Although we had the ceiling fans at high speed, the air seemed to stagnate above us. For our second night they had a room with AC available, their honeymoon suite, so we moved first thing in the morning before wandering out through the streets to find the much raved about Brahma temple. We took out the strollers for the kids, to provide them some shade and personal space. It was here that Eilir remarked that all the cows seemed to be homeless. I was surprised it took the kids this long to realize something was amok with the cows. A lightbulb went off in her head as she queried, “Why don’t they just build some barns? 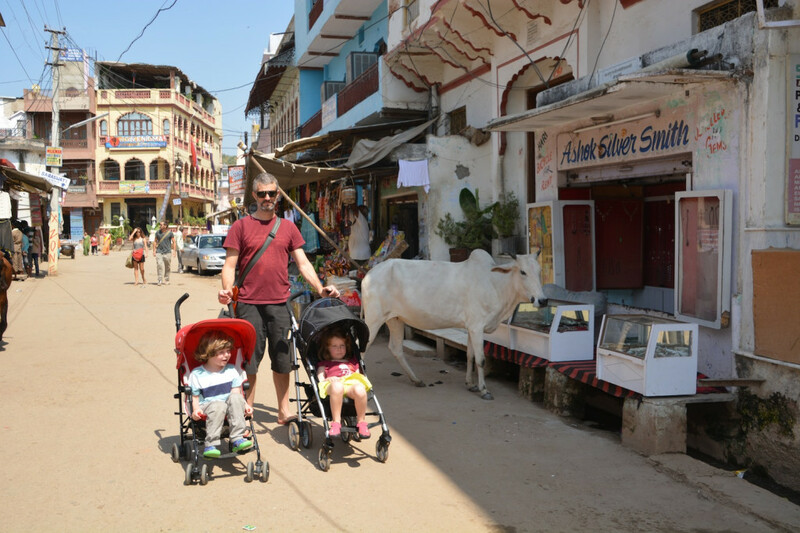 Then the cows would not be homeless and the streets would be clean!” At every turn, something seemed to go wrong for us in Pushkar. We almost melted in the heat and humidity. The final straw was receiving our laundry back with items missing but not noted. When I realized that Eilir’s pajamas were gone—her one and only pair on the trip—I was told, “Oh, yes, we forgot to mention, the dog ate your daughter’s pajamas”. I spent the better part of an hour discussing the facts of the case of the lost silk/bamboo blend peacock pajamas in utter disbelief with the laundry manager, to no avail. Back to luxury for us, as we left Pushkar for Jaipur, our pilgrimage complete. This is great Alexis. I am enjoying every new posting. I am so happy for you and Staffan. A lifetime of memories and stories. Great post! Bummer about the jammies.